I love these glasses. We use them for hot tea! 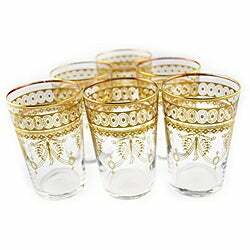 Originally, Moroccan glasses were used for tea, but these can also be used for votive candle holders. 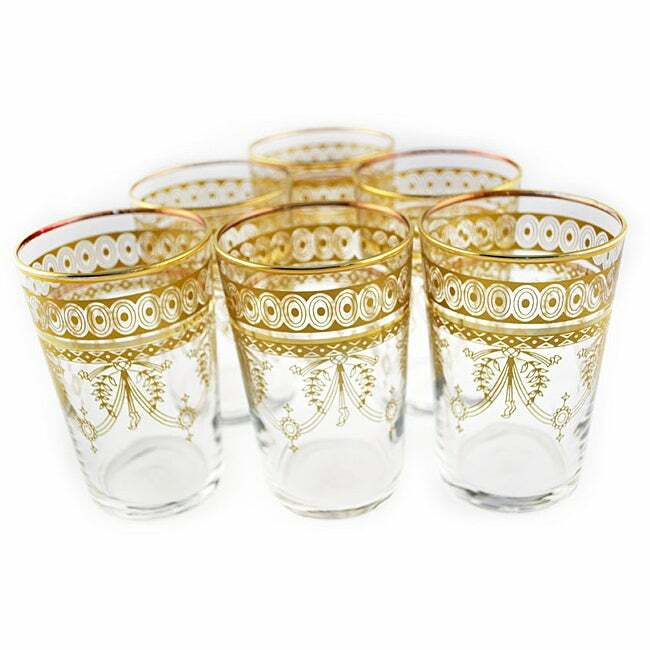 This set includes six tea glasses with gold accents. This pouf was handmade by skilled men and women artisans from different regions of Marrakesh in Morocco. The process of making this pouf has been passed on from generation to generation. Also as these artisans work closely with designers; they add contemporary twist to their work which makes their products unique and more sophisticated. Some artisans work in a workshop and some work from their homes, especially women who are stay-at-home moms that have skills and like to contribute to the economy while taking care of their children and homes. Making these poufs is helps make a living for these artisans and the more they sell, the more they better the lives of their families. "Can these glasses be used for everyday use? Also are they hand-wash only?" The glasses can be used for everyday, it is recommended that they be hand washed. Unicorn Play Tea Set - Child Size Teacups, Saucers, and Serving Tray - 9" tray, four 3.5" plates - 9 in. x 12 in. x 3.5 in.